Senior Russian politicians have dismissed accusations by Theresa May that Moscow has meddled in elections and carried out cyber-espionage. On Monday night, Mrs May accused Moscow of "planting fake stories" to "sow discord in the West". She said Vladimir Putin's government was trying to "undermine free societies". Russian senators accused the UK PM of "making a fool of herself" with a "counterproductive" speech. 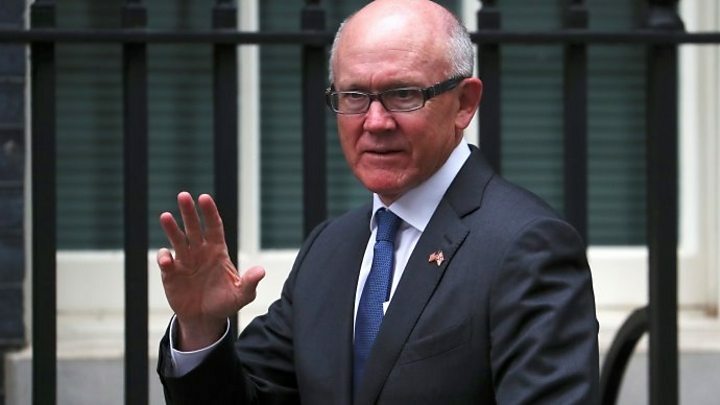 But the top US diplomat in the UK, Woody Johnson, said countries engaging in such behaviour needed to be "called out". President Donald Trump's newly appointed ambassador to the UK told BBC News that Mrs May "probably has evidence" of Russian meddling and she had "every right" to draw attention to it. 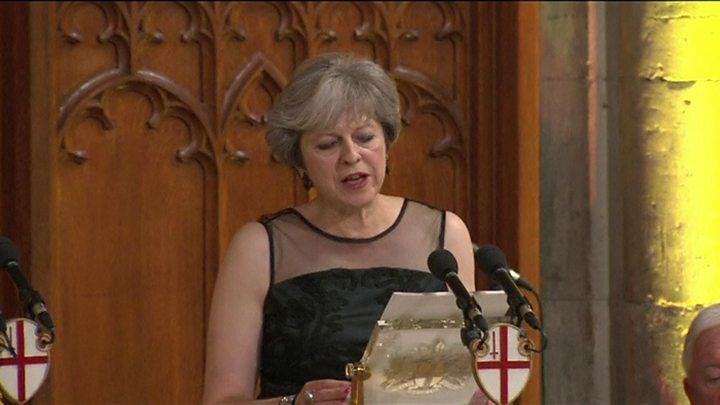 Mrs May's comments, at the Lord Mayor's Banquet at London's Guildhall, were in contrast to those of US President Donald Trump, who last week said he believed President Putin's denial of intervening in the 2016 presidential election. The Russian Embassy in the UK hit back at her criticism on Twitter and described her remarks as "fake news". Alexei Pushkov, a Russian senator involved in media policy, said: "The world order that suits May, with the seizure of Iraq, war in Libya, the rise of IS and terrorism in Europe, has had its day. You can't save it by attacking Russia." Leonid Slutsky, the chairman of the foreign affairs committee in the lower house of Russia's Parliament, said: "Russia, like the UK, is by no means striving to bring back the Cold War. We are ready to develop a mutual dialogue and partnership relations." He added: "In this case, I completely disagree with the statement that Russia is allegedly trying to undermine the international system of rules." And Frants Klintsevich, deputy chairman of the defence and security committee in the Parliament's upper house, said: "May has done more damage to herself than to us, making a fool of herself in the eyes of the world community and once again raising Russia's profile." UK Foreign Secretary Boris Johnson is due to visit Russia next month. In what Mrs May described as a "very simple message" for President Putin, she said he must choose a very "different path" from the one that in recent years had seen Moscow annex Crimea, foment conflict in Ukraine and launch cyber-attacks on governments and parliaments across Europe. Russia could be a valuable partner of the West but only if it "plays by the rules", she argued. "Russia has repeatedly violated the national airspace of several European countries and mounted a sustained campaign of cyber-espionage and disruption. "This has included meddling in elections and hacking the Danish Ministry of Defence and the Bundestag among many others. "We know what you are doing and you will not succeed. Because you underestimate the resilience of our democracies, the enduring attraction of free and open societies and the commitment of Western nations to the alliances that bind us." She said that as the UK left the EU and charted a new course in the world, it remained absolutely committed to Nato and securing a Brexit deal which "strengthens our liberal values", adding that a strong economic partnership between the UK and EU would be a bulwark against Russian agitation in Europe. There are some countries in Europe that believe the West should engage more closely with Russia. They argue the European Union and the United States should better understand Russia's point of view, its belief that it is threatened from all sides. And that more should be done to accommodate this sense of vulnerability, by softening Nato's approach and reducing sanctions. Well, not Theresa May. In a speech in the US in February, the prime minister spoke of the need to "engage but beware" of Russia. She has now switched the order and the focus is very much on beware. She believes that President Putin should be called out for the threat that she believes he poses both internationally and in the UK. The Electoral Commission is investigating claims that Russia used social media to meddle in the Brexit referendum. So Mrs May is willing to engage with Russia - she is sending the foreign secretary to Moscow next month. But she also wants Russia to know that Mr Johnson will come with a clear message that its destabilising activities will no longer be tolerated. 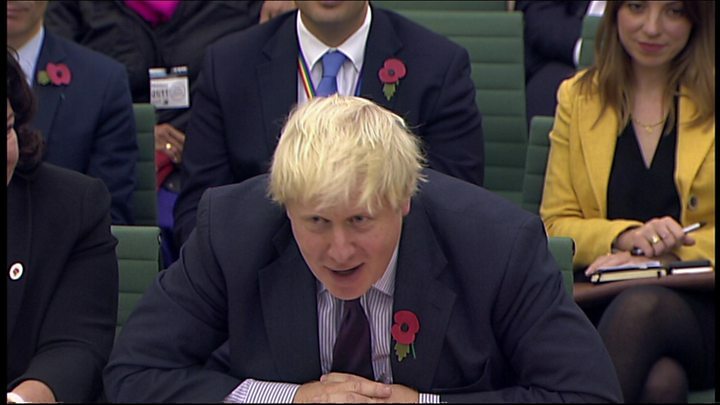 Mr Johnson, who will be making his first trip to Russia as foreign secretary in December, has said the UK's policy to Russia must be one of "beware but engage" following a decade of strained relations. He told MPs earlier this month that he had not seen any evidence of Russia trying to interfere in British elections or the 2016 Brexit vote, in which Moscow has insisted it remained neutral. In her speech, Mrs May said the UK would "take the necessary action to counter Russian activity". "We do not want to return to the Cold War or to be in a state of perpetual confrontation. "As a permanent member of the UN Security Council, Russia has the reach and the responsibility to play a vital role in promoting international stability. "Russia can, and I hope one day will, choose this different path. But for as long as Russia does not, we will act together to protect our interests and the international order on which they depend."